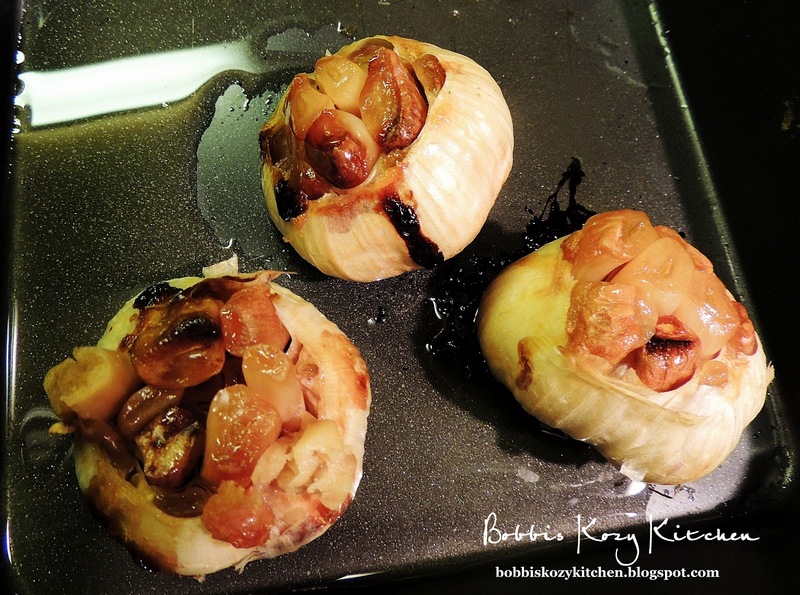 I wasn’t sure if I should do a post on how to roast garlic. I thought maybe people would read it and say, “Well duh Bobbi I know how to do that!”. But then I remembered back, not so long ago, when I didn’t know how to do it so I figured that this would be for those people. 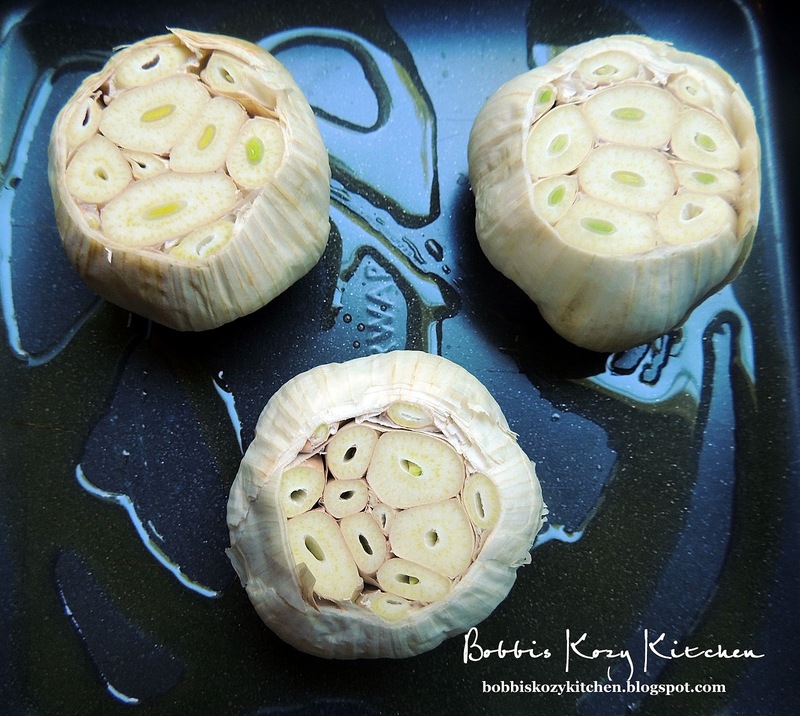 I don’t want one person to miss out on the great taste of roasted garlic! I use it in all sorts of things. One of my favorites is Roasted Garlic Mashed Potatoes or the healthier version Roasted Garlic Mashed Potatoes and Cauliflower. 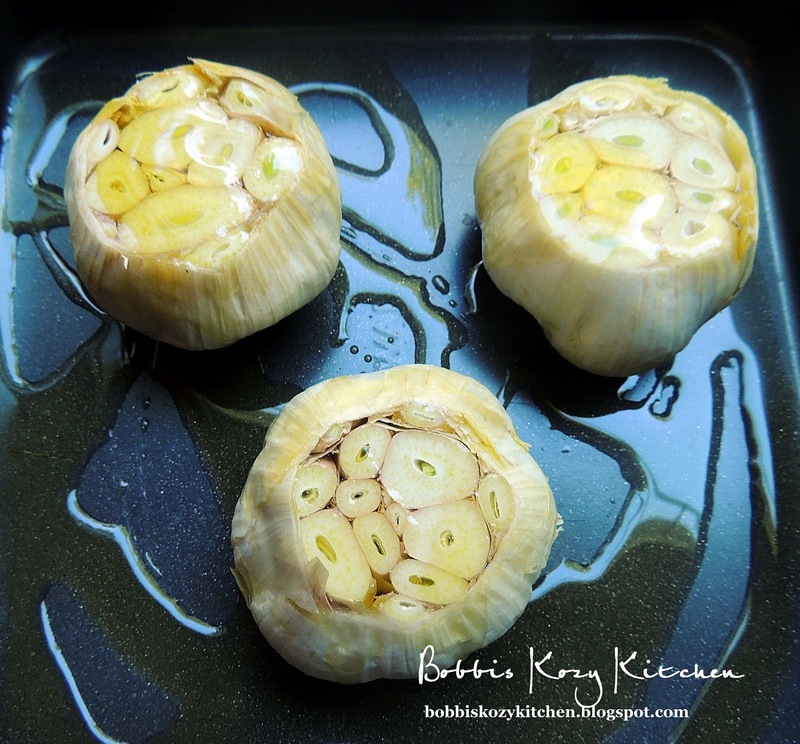 Roasted garlic can be substituted for regular garlic if you want a milder, sweeter flavor. 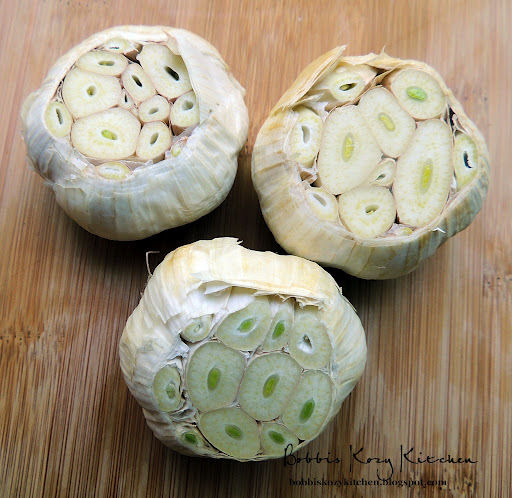 Raw garlic can be up to 4 times stronger than roasted garlic. So let’s get started. 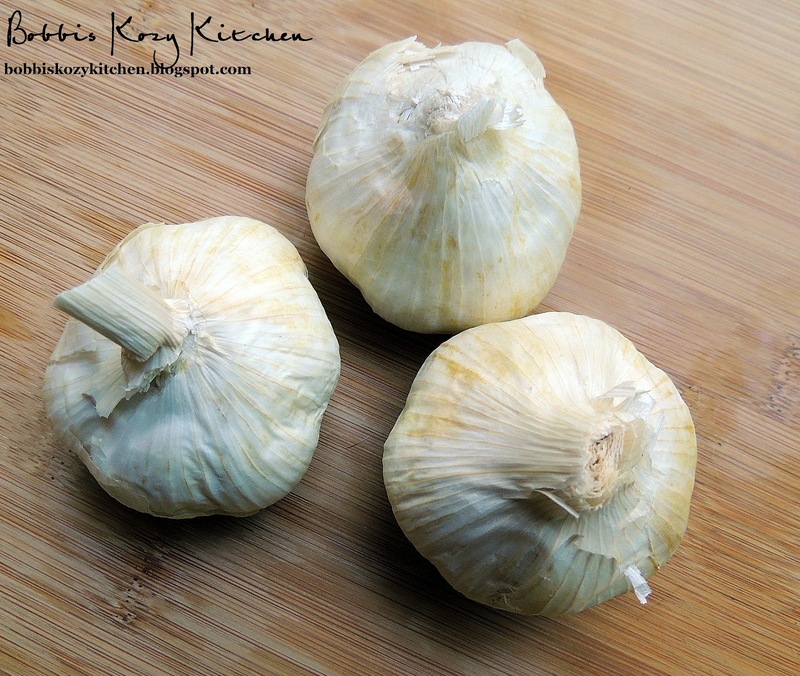 Preheat your oven to 375 degrees F. You can roast garlic ahead of time and store it in the fridge in an airtight container for several day. But trust me, if your house is anything like my house it will be eaten like candy and be gone in a heart beat so you might want to make extra! 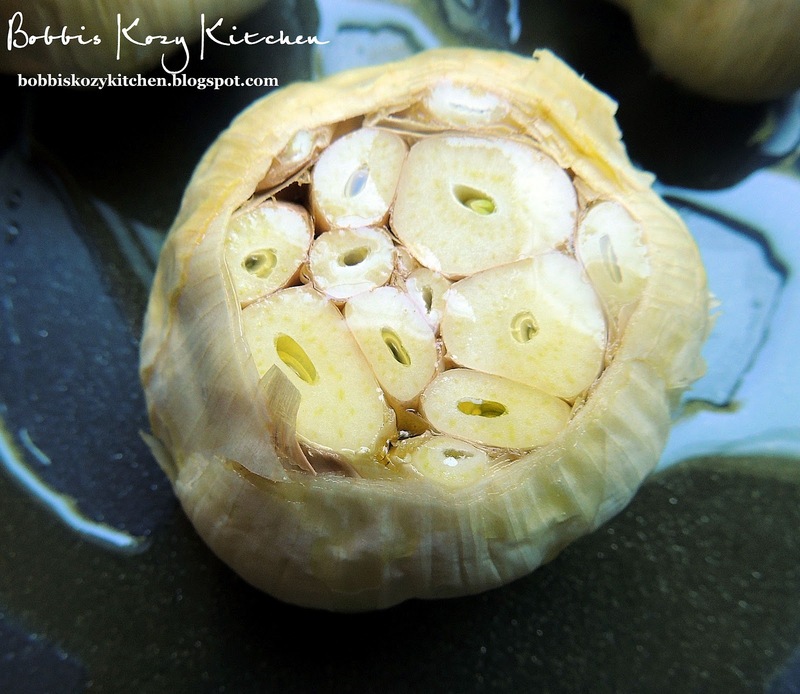 With a sharp knife cut the top off the garlic head. Just far enough down to expose the cloves. Drizzle a bit of olive oil on the bottom of a pan, I used an 8 x 8 cake pan but use whatever pan fits your garlic and works for you. Lay the garlic on the flat end. If it is not flat enough youcan cut just a bit off the other end to make it lay flat. Drizzle each head with a tablespoon or so of olive oil. Let it sit a minute or so to let it soak in and then add another tablespoon. Now they are nice and greased up and read to get their roast on! I can’t wait!! Cover the pan tightly with foil and pop it into the oven. Now comes the bad part, you have to wait for an hour!! Cook time may be less for smaller head with smaller cloves so start checking it around 45 mins. Once the cloves are nicely brown, soft, and pulling away from the skin, you are in business! WALA roasted garlic!! OK I agree it does look kind of like an alien but it tastes really good I swear!! Once the heads have cooled a bit just give them a squeeze and the cloves will pop right out for you. Now you can try it in/on everything. We eat so much garlic here I swear we will ever have to worry about vampires!